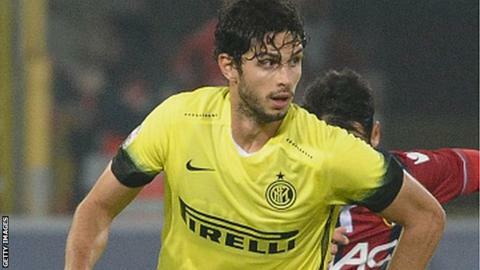 Norwich have offered Inter Milan 10m euros (£7.3m) for their Italy international central defender Andrea Ranocchia. It is understood Norwich have offered Ranocchia a salary in the region of 3m euros per year. The 27-year-old, who has won 20 caps for Italy, has played over 120 times for Inter and was captain last season. But he has been relegated to the bench in the current campaign, in which Inter lead the Serie A table going into 2016. Inter's depth of defenders means they are likely to allow Ranocchia to leave but the centre-half, who made his Inter debut in 2011, is thought to be be undecided about the move. Norwich are 15th in the Premier League after 19 matches, having won two of their last three fixtures.